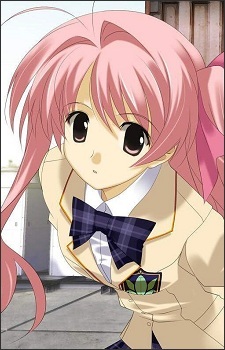 Rimi is one of the main characters in ChaoS;HEAd and is the main female protaganist. Her first appearance in the anime towards the end of the first episode where Takumi finds her standing in front of a dismembered corpse. Here, she seems to recognize Takumie, even though he himself doesn't recognize her. The next day at school she is seated next to Taku where, although he mysteriously knows her name, believes she is there to kill him. Over the next few days and weeks, Rimi becomes good friends with Takumi, with Takumi relying heavily on her. However soon after, it is discovered she is a Giglomaniac, causing Takumi to try and discover the truth, which in turn leads to him discovering the truth about Rimi. While Rimi was absent from school, it was found she was visiting Shogun (the real Takumi) and discussing what she should do. Before Takumi finds out he is a delusion, she attempts to protect him from the truth, however when he does, she attempts to try and save his sister Nanami (who had been captured beforehand). However during the rescue attempt she is captured herself where Takumi eventually comes to save her. After the final battle between the Giglomaniacs and Noah II, Rimi kisses Taku before she prepares to kill him, however after iterating his desire to live she spares him. The show ends with Rimi and Taku confessing their love for each other, and with the rest of the Giglomaniacs, repairing the city from the previous battle.